A few months ago, we released a double-eBook of Mrs. Alex. McVeigh Miller’s The Bride of the Tomb; and Queenie’s Terrible Secret. 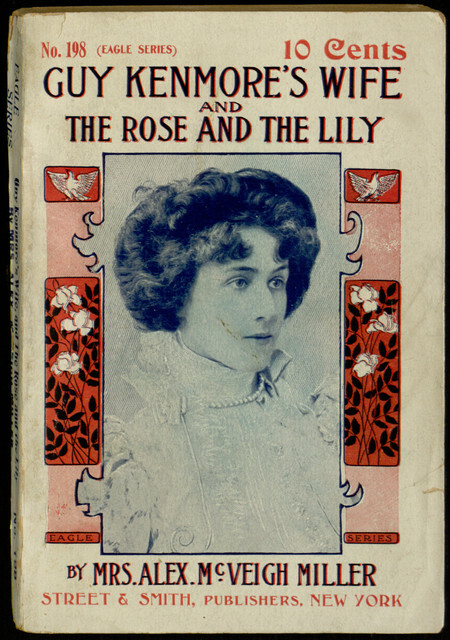 Today, work has been completed on another omnibus edition of Mrs. Miller’s works, featuring Guy Kenmore’s Wife; and The Rose and the Lily. As in the previous collection, the two stories stand alone but share key thematic elements. Also as before, the tales are filled with plot twists, excitement, and highly improbable coincidences. To say too much would be to spoil the joy of discovery; half the fun of these books is seeing just how far the author would go to keep readers interested and engaged! It is worth noting that Guy Kenmore’s Wife (originally serialized in the New York Family Story Paper under the title Irene Brooke) has a slightly slower start than some Mrs. Miller novels — but once it gets its momentum going, it doesn’t stop! 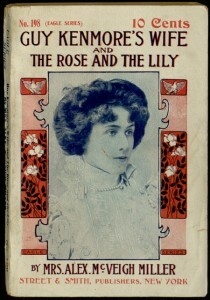 The Rose and the Lily is a slightly shorter and less complex story, also originally published in the Family Story Paper, but noteworthy for being written entirely in the present tense. If you have enjoyed our previous dime novel and story paper offerings, there is much more to enjoy here. The stories can be read online or downloaded in a variety of popular formats through Project Gutenberg.